Your equipment relies on powerful, efficient hydraulics to perform key tasks. Like any precise component, hydraulics can be highly sensitive to contamination from dirt, dust and other substances. 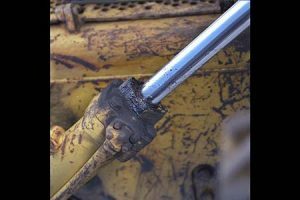 The chrome surface of a hydraulic part is its first line of defense against these contaminants. When scratches, dents and other wear build up, you need resurfacing to ensure the safe and reliable operation of your machine. Gregory Poole offers unmatched cylinder rod resurfacing services. Our technicians receive factory training on Cat® equipment and are fully qualified to perform rechroming, polishing, cylinder honing, straightening and other services that extend the life of these important components. When you choose the Gregory Poole machine shop, you can benefit from the Cat-exclusive Advanced Surface Technology (AST). This high-velocity thermal spray process, an alternative to traditional rechroming, delivers better wear resistance, faster application times and up to three times the component life. It is harder than chrome plating and more resistant to scratching, dents and bending. Contaminants are less likely to enter sensitive hydraulic mechanisms, and the component as a whole lasts longer. AST is also up to six times faster to apply. We can complete a job that would take 18 hours using a standard rechroming process in often as little as three. You get your cylinder back and can get up and running again, faster. We are pleased to offer both AST and conventional hydraulic resurfacing to meet the needs of a diverse group of government clients. We are sensitive to the fact that contractors are under considerable scrutiny to turn around complex jobs faster. When issues with any of your fleet’s hydraulic components threaten your ability to do that, make us your first call. You’ll get advice on the best way to get the job done as quickly and economically as possible — without sacrificing the quality you’ve come to expect from eastern North Carolina’s exclusive Cat dealer. Contact the Gregory Poole machine shop today to find out more about your cylinder rod resurfacing options or request a quote for service.